Skiers and snowboarders ride the Ajax Express up Aspen Mountain on Saturday for the extended weekend. Aspen Skiing Co. will be audited on the number of employees it needs to run its expanded operations on Aspen Mountain once they are functional. Spurred by Skico’s updated mountain master plan, the Aspen-Pitkin County Housing Authority board recommended Wednesday night that Skico be audited two and five years after it completes three elements of its expansion plan: added terrain in the Pandora area served with a new chairlift, an expansion of the Sundeck and a renovation of Ruthie’s Restaurant. 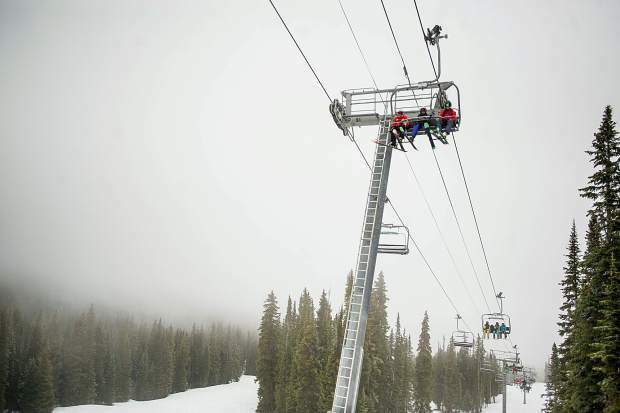 As part of its master plan that is under review by the U.S. Forest Service and Pitkin County, Skico also plans to add snowmaking infrastructure at the top of the mountain. David Corbin, Skico’s vice president of planning and development, explained that they are using a baseline of housing employees created in 2008 by staff and Pitkin County after summer amenities were added to the top of the mountain. It was calculated then that there are just over 164 full-time employees who are needed to operate Aspen Mountain, and that’s the number that will be used to base any future audits. “We accept that number and we believe it’s accurate,” Corbin said. He added that the expansion of amenities might not necessarily necessitate additional workers. An audit has been recommended to the county for approval rather than immediate housing mitigation because the expansion is attached to commercial activities instead of buildings. Once those commercial activities commence, it can be determined if more employees need to be accounted for as it relates to housing mitigation. The first audit will occur within two years of the date of issuance of a “Certificate of Occupancy” or “Letter of Completion” for the expansion of the Sundeck, the renovation and reopening of Ruthie’s Restaurant and Pandora terrain. The second audit will be completed within five years. Other aspects of the updated master plan include chairlift updates and realignments; a new ski patrol headquarters building at the top of the mountain (the existing headquarters will be demolished and removed from the site); upgrades and expansion; redevelopment of the existing Buckhorn Cabin; installation of additional cell tower sites, data equipment, fiber optic lines and antennae tower sites; summer and multi-season projects; and the continuation of summit landscaping, including improvements in and around art, music and wedding venues.